Ahh, the finished product! It looks so pretty, like a flower, a real nice presentation to serve for a dinner party dessert , afternoon tea or just for yourself. I made these beauties with organic granny smith apples and left the skins on, so they not only provide more fiber, but also hold their shape better. Prior to baking you can see the pretty green outline, although once baked it fades away, but still looks beautiful. There is a delicious caramel sauce you drizzle prior to baking and then you can add just a touch on top once it comes out of the oven. Dust with some confectioners sugar and its the perfect dessert, treat or indulgence. 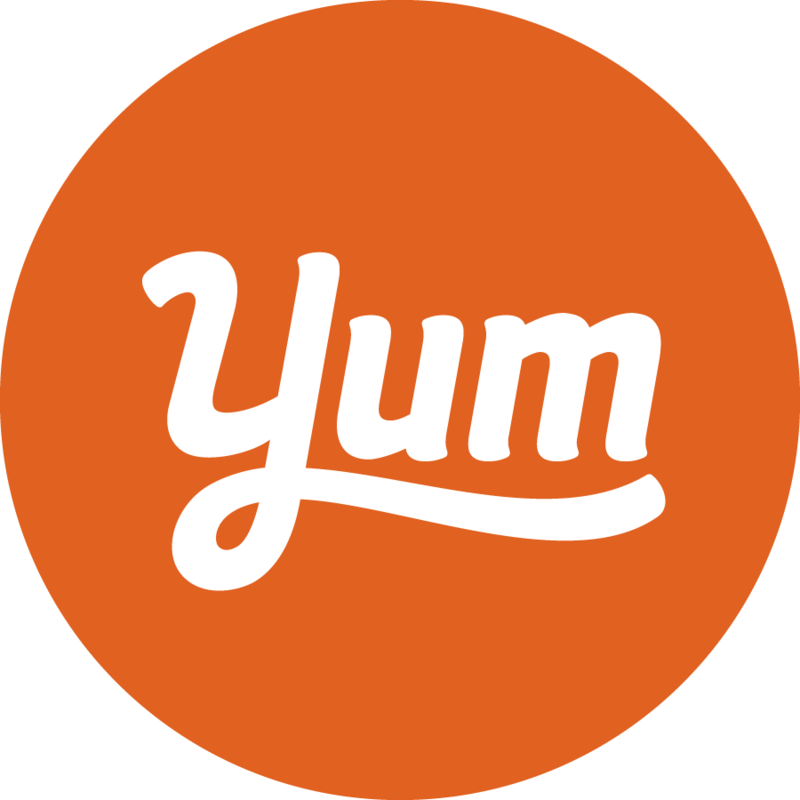 Place the flour salt and sugar in a food processor and pulse for 3 seconds. Add the cubed butter and pulse until it resembles sand texture. Pour the milk onto the mixture and keep pulsing until it forms a ball. Remove onto a plastic wrap sheet and form into a disc. Completely cover with the wrap and refrigerate for at least 1 hour. Also place your tartlet tins in the refrigerator. Remove the dough and place on a floured flat surface. Roll with a rolling pin to a 1/4 inch thickness moving quickly. Take a 5 inch circle and cut around for the tartlets. Once you place the dough inside the tartlet you will have enough to go up on the sides of the 4 inch tartlet tin.Repeat with the rest of the dough. Poke pastry several times with a fork. Place the tartlets onto a baking sheet into a preheated 375 degree oven for 10 minutes. Remove and allow to cool. Place the sliced apples in a large bowl and sprinkle with the sugar and cinnamon. Carefully toss to coat. Cover and place in refrigerator for about an hour to macerate until the apples become pliable enough to bend easily. 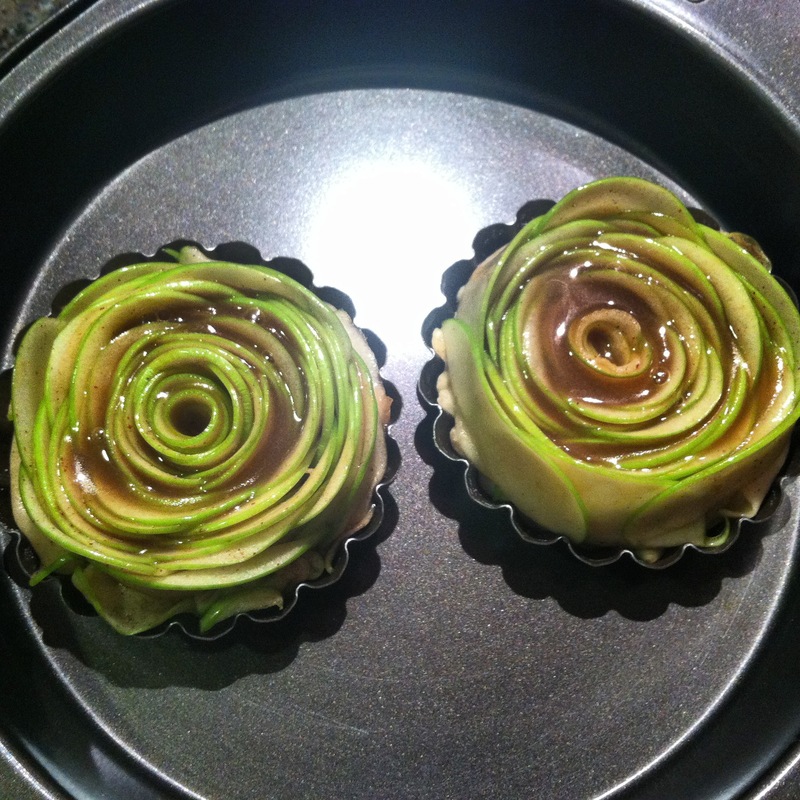 After the tartlets have baked for 10 minutes and slightly cooled, start making the rose shaped apple pieces. Take one apple slice and roll it for the starting point in the center of the tartlet. 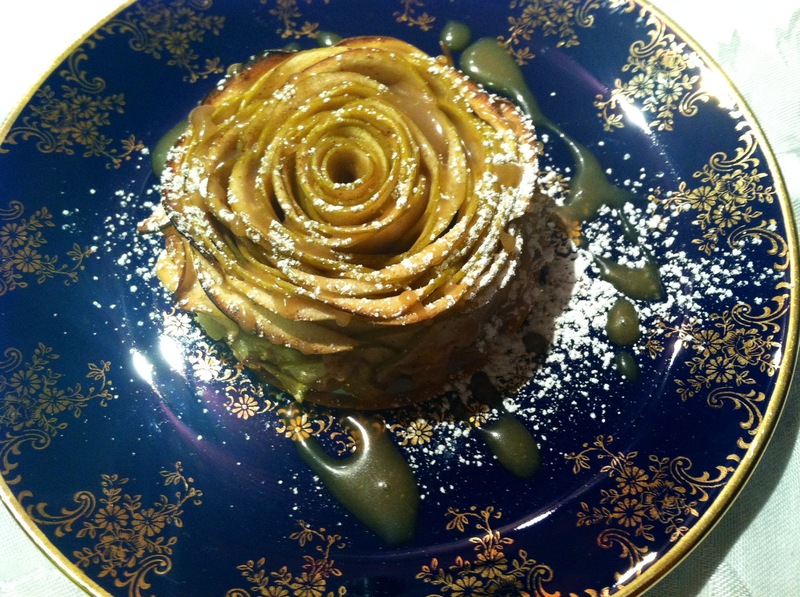 Then keep adding overlapping apple slices, like a rose petal overlaps on the flower. Continue until you fill the tartlet. Repeat this with remaining tartlets. Drizzle about 1 tablespoon of the caramel sauce over each tartlet. Place back in the oven for 30 minutes. Remove and allow to cool slightly before removing from the pans. Serve with additional sauce and confectioners sugar.